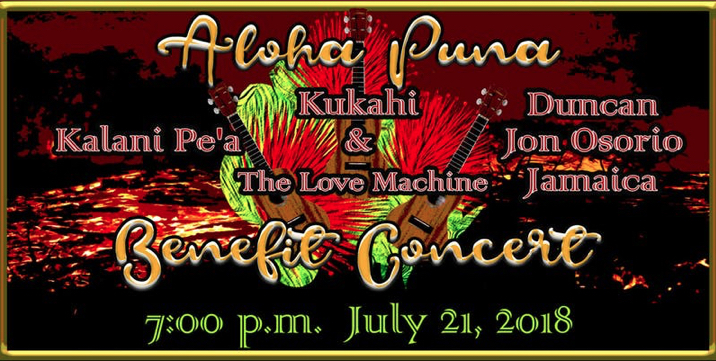 MAUNA LANI—On Saturday, July 21, 2018, Na Hoku Hanohano Award-winning stars will align to perform at, “Aloha Puna” a beneﬁt concert put together by Makaliʻi Productions in partnership with Tommy Bahama to help those who are aﬀected by the volcanic eruptions. Grammy Award and Na Hoku Hanohano Award winner Kalani Peʻa will be performing on stage, as well as Na Hoku Hanohano Award winner Kūkahi, and his band the L.O.V.E Machine (Hawaiʻiʻs youngest professional sibling band) and Na Hoku Hanohano Award winner Jon Osorio. Joining him are Duncan Kamakana Osorio (The Voice) and renowned poet Jamaica Osorio. Kalani Peʻa made history in 2017 as the ﬁrst Hawaiʻi recording artist to win a Grammy Award in the, “Best Regional Roots Music Album” category, as well as a Na Hoku Hanohano Award for, “Contemporary Album of the Year.” The Big Island Native was willing to clear space in his hectic schedule to perform for Aloha Puna and is eager to help those who are in need. The internationally acclaimed Singer-songwriter will be bringing members of his band from Maui to entertain at the event. His highly anticipated Sophomore album, “No ʻAneʻi” is scheduled to be released on August 10 (pre-sale on iTunes in July) followed by tours in the mainland US, and Japan. Island resident celebrated his eighteenth birthday by performing for charity and looks forward to entertaining the audience with his band The L.O.V.E. (let our voices echo) Machine, made up of his four siblings and mom. Big Island Native Dr. Jon Osorio is an award-winning songwriter and composer. He won a Na Hoku Hanohano Award for the widely popular song “Hawaiian Eyes,” in collaboration with Randy Borden. Jon has opened for such notable acts such as Natalie Cole, The Jacksons, and Joe Cocker among others. In addition to being a musician, he is an editor, published author, and the Dean of the School of Hawaiian Knowledge at the University of Hawaiʻi at Manoa. This multi-talented musician will share the stage with Duncan Kamakana Osorio, a known singer-songwriter who starred in local commercials and appeared on The Voice, and celebrated slam poet Jamaica Osorio, a three-time national poetry champion who performed at the White House and was showcased on HBO. Aloha Puna will take place at the Tommy Bahama Courtyard at the Mauna Lani Shops on Saturday, July 21. Proceeds for Aloha Puna will be donated to The Salvation Army, to beneﬁt those who are directly aﬀected by the Puna Lava ﬂow and Kilauea ash eruption events. Tickets for the concert are available for sale at Tommy Bahamaʻs in Mauna Lani, and online at Eventbrite. Each ticket will include a Tommy Bahama dinner entree, two drinks, and a three- hour concert by Na Hoku Hanohano award-winning musicians.